Duncan Stewart reckons he was due the lucky break which earned him the chance to create a slice of European Tour history in the innovative short shoot-outs that will decide the inaugural ISPS Handa World Super 6. The 32-year-old’s tee shot at the first extra hole in a play-off at Lake Karrinyup in Perth, Western Australia was fortunate to clip a branch, allowing him to safely find the green in two and go through to the match-play phase with a par-4. “It made up for my putt at the last in regulation,” said Stewart, having seen a 20-foot par effort lip out to leave him among eight players battling it out for the final five spots in the 24-man line-up for the ground-breaking last day. “I’m pleased to get through,” added the Grantown-on-Spey man, who ended a run of five straight missed cuts to start his European Tour campaign by carding a 65 on Friday before backing that up with a solid 71 for a seven-under-par 208 total. Stewart’s opponent in the opening round is Japanese player Hideto Tanihara, the tie having added spice due to it being the first one out and, therefore, providing an opportunity for someone to earn a place in the record books. With the top eight after 54 holes receiving byes, Brett Rumford awaits the winner after the Perth native led the qualifiers by five shots, carding impressive rounds of 66, 65 and 68 for a 17-under-par aggregate, but now has to start all over again. Former Scottish Open champion Jeev Milka Singh joined Stewart in coming through the play-off, as did Australian pair Sam Brazel and Matthew Millar and 17-year-old Thai player Phachara Khongwatmai, who beat Kiwi Ryan Fox at the third extra hole to secure the last of the spots. Khongwatmai’s par was good enough to go through after Fox, the son of All Blacks legend Grant, three-putted. Elsewhere, Paul Lawrie is in contention heading into the final round of the Dimension Data Pro-Am at Fancourt in South Africa. 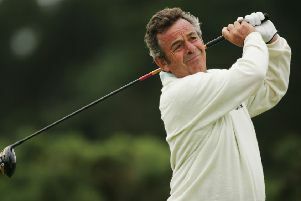 The Aberdonian, who is being partnered in the team event by his youngest son, Michael, carded a third successive 69 for 10-under-par total, sitting just two shots off the pace in joint 11th on a tightly-packed leaderboard. “Played good again but left some shots on the greens unfortunately,” said Lawrie, who is chasing a first victory since the 2012 Johnnie Walker Championship at Gleneagles. South African-based Scot Doug McGuigan sits joint 18th while Blairgowrie’s Bradley Neil also made the 54-hole cut in a share of 59th.